Online orders and phone orders are processed through our central call center in Austin, Texas from 8am to 5pm CST, Monday through Friday. Orders placed before 3pm CST on business days will ship out the same day. We use both UPS and FedEx Ground services for most heavy duty products. Most orders arrive in 1 to 2 business days depending on the customer's location. Orders are distributed through our nationwide network of shipping warehouses; every product is shipped from a warehouse closest to the customer, insuring maximum delivery speed. All industrial radiators ship via regional freight providers with a freight class between 85 and 100. Freight shipments usually take 2 to 5 business days for arrival. For more information about our distribution & shipping warehouses, please visit our Locations page. Shipping Estimate: Please note that the shipping quote provided by our online shipping calculator during checkout gives an accurate estimate of actual shipping charges. However, it may vary slightly from the final charge. In particular, items that are too big to ship via regular ground transportation and have to ship by freight truck will cause a variance in price. We will contact the customer directly if the final shipping charge is significantly higher than the online estimate. Receipts & invoices are emailed to customers immediately after payment online or by phone. Shipping notification and tracking information is emailed to customers when items leave our warehouse facilities. Registered users can check their order history, status and tracking information by logging into their account from the top of our website. Guest users who use our "Guest Checkout" option when purchasing products will need to rely on the emails sent from us as described above. For immediate updates on estimated arrivals or pending tracking numbers, call 1-800-578-8416 Ext. 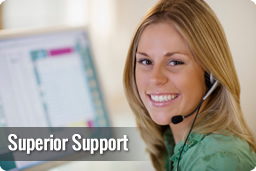 #1 or email support@superiorcooling.com. All new items may be returned for a refund if reported to us within 5 business days of receiving the product. Returns must be issued an RMA number by a Superior Cooling agent. All returns are subject to a 20% restocking fee based on the cost of the order. Freight charges are non-refundable and return freight is at the expense of the purchaser. Requested returns after 5 days but within 30 days of receipt are valid for exchange or store credit and subject to a 20% restocking fee based on the cost of the item. Cash back return requests after 5 days from purchase but no more than 60 days may be granted at the discretion of Superior Cooling with a 25% restocking fee, but not guaranteed. No items over 60 days of receipt are valid for return unless exchanged through our defective exchange or warranty policy. All radiators and other products requiring custom builds, custom modifications at the factory, or custom parts that will be modified upon receipt are non-returnable. If you have ordered the wrong part and exchange that part through our service, a 10% restocking fee will be applied against your credit to cover the expenses of the return. Superior Cooling warrants its products to be free from defects in material and workmanship for 12 months from date of shipment to the original consumer purchaser. All items are new unless listed as rebuilt, refurbished or reconditioned with a full twelve (12) month warranty unless stated otherwise. If you have a warranty claim, the item may need to be returned for inspection before credit can be issued. Superior Cooling's warranty is a "part only" warranty. The expressed warranty DOES NOT cover labor, machine rental, down time or collateral damage at any time. For more detailed information regarding our warranty policy, please visit our Warranty Policy page. When personal information (such as your credit card number and registration information) is transmitted to us through our web site, it is protected securely through the use of encryption using the Secure Socket Layer (SSL) protocol. You can verify this by clicking the lock icon at the top or bottom of your web browser to view our SSL validation certificate, or by looking for "https" at the beginning of the web address when visiting secure pages such as our online checkout area or when logging in to view your personal account. Superior Cooling collects and uses your personal information to deliver the services you have requested. Only employees who need the information to perform a specific job (for example, billing or customer service) are granted access to personally identifiable information. The computers/servers in which we store personally identifiable information are kept offsite in a data center in a secure environment. Customers are highly encouraged to create an account with our store when purchasing items online. By creating an account on our website, the customer will be able to move through the checkout process faster, store multiple shipping addresses, view and track orders in your account and more. Customers may also update their account information at any time by logging in securely through the "Log In" button at the top of our web site.